Moore’s Law (a doubling of transistors per CPU every two years) has driven the astonishing rate of decline in computing. But in recent years, the cost of sequencing genes has been falling faster than the cost of computing. Currently, when done in bulk with quantity discounts, full sequencing costs about $100 per person, while “genotyping,” which captures all of the common variants, costs $25 or less per person. I know this because I have recently added genomics to my research portfolio, starting with a research project focusing on the quantitative aspects of assortative mating. (Assortative mating is when people choose mates whose genes are more similar to them than would happen by chance.) Today I am on my way to a conference on "Polygenic Prediction and its Application in the Social Sciences" at the University of Southern California. About 99% of the 6 billion steps in the spiral staircase of DNA’s double helix are the same for all of us. This is what makes us human. Behavioral geneticists are interested in the 1% of DNA that makes us individuals. A century of research has found that these inherited DNA differences account for about 90% of the differences in people’s physical traits, such as height and eye color. What may come as a surprise is that DNA also accounts, on average, for about 50% of our differences in such psychological traits as personality, mental health and illness, and cognitive ability and disability. … bigger is better when it comes to studies of heritability. … For bipolar disorder, going from 2000 cases in a 2007 study to 20,000 cases in 2017 increased the number of significant associations from zero to 30. The largest of these individual effects is minuscule, however; each one increases risk infinitesimally. But what good are such tiny effects? The answer is that summing the effects of thousands of SNPs can create powerful DNA fortunetellers. These are called polygenic (“many gene”) scores, and they are the stuff of the coming DNA revolution in psychology. 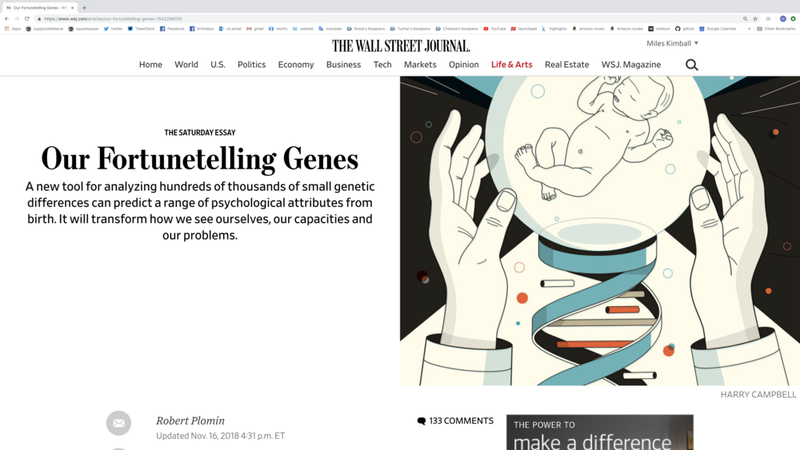 With polygenic scores, we can predict psychological traits from inherited differences in DNA without knowing anything about the long and convoluted developmental pathways between genes and behavior, pathways that meander through gene expression, proteins and the brain. Unlike other predictors, this DNA fortuneteller can predict from birth because inherited DNA differences do not change from cradle to grave, from the single cell with which we begin life to the trillions of cells in our adult bodies. In 2013, in a paper in the journal Science, Daniel J. Benjamin of the University of Southern California and his colleagues in the Social Science Genetic Association Consortium used a sample of 125,000 individuals to produce a polygenic score that predicted 2% of the variance of educational attainment. In 2016, they used a sample of 294,000 and predicted 3% of the variance, as reported in the journal Nature Genetics. In 2018, with a sample of 1.1 million, the predictive power of their polygenic score jumped to more than 10% of the variance, as reported in Nature Genetics. Years of education is a coarse but interesting variable because it captures what it takes to finish university, but the consortium also found that the polygenic score from their largest sample predicts up to 10% of the variance in general cognitive ability (that is, intelligence or IQ). My own research team, led by Andrea Allegrini, showed that this score also predicts 15% of the variance in nationwide tests of school performance in the compulsory subjects of English, mathematics and science given to all U.K. students at the age of 16, a finding that we previewed in the journal BioRxiv earlier this year. … Polygenic scores for educational attainment not only predict performance in school but also success later in life, such as mate choice, occupational status, social mobility and even financial planning for retirement, as shown by Daniel W. Belsky and colleagues at Duke University in a paper called “The Genetics of Success” that was published in the journal Psychological Science in 2016. The reason for the wider effects of the polygenic score for educational attainment is that it taps into other traits needed to succeed in higher education, not just intelligence but also qualities such as conscientiousness, grit and mental health. Social science genomics seems to me to have enormous potential for doing good in the world. Those in the field of social science genomics don’t make the mistake of thinking that just because something is genetic that nothing can be done about it. Nothing could be further from the truth. The typical gene of interest to social scientists acts through a long change of causation, involving many steps within the social world—steps where the causality can readily be modified by policy. A simple example can make clear how having a genetic cause can be consistent with effective interventions. There are genes for nearsightedness. But those genes only make people nearsighted in a truly damaging way if they can’t afford glasses or contact lenses. By the intervention of corrective lenses, we interrupt the effects those genes would otherwise have on eyesight from a functional point of view. Another more speculative example also makes the point that showing that something has a genetic basis can sometimes mean it is easier, rather than harder to modify. Genetics may play an important role in whether or how much of the time someone has a leaky gut. But the consequences of a leaky gut are much more severe when you are eating things that are damaging once they get into the bloodstream. (See “What Steven Gundry's Book 'The Plant Paradox' Adds to the Principles of a Low-Insulin-Index Diet.”) Genes that predict those diseases because they predict a leaky gut might then also predict that dietary modifications could help. How Strong is the Economics Guild? Eric X. Li: Is Democracy Necessary?